Home / man city / man utd / manchester city / manchester united / 'M' is Mahrez, 'marquee' signings and 'more' success for City and possibly even for United! 'M' is Mahrez, 'marquee' signings and 'more' success for City and possibly even for United! Although much has been made of Manchester City's chances of winning the Premier League for two consecutive seasons, I do not see this as a dot on the cards. While the acquisition of the tried and tested performer Riyad Mahrez from Leicester seems to be the kind of signing who can hit the ground running, can the same be said about Claudio Gomes (arriving from PSG) and Philippe 'Adam' Sandler from PEC Zwolle? Although City can expect to have another successful season ahead of them, opponents have strengthened significantly and now the champions are the team that everyone will go all out to beat. Additionally, the fans (who have been through more thick than thin over decades of loyally supporting City) may be more expectant than normal, which could add unnecessary pressure to the team. 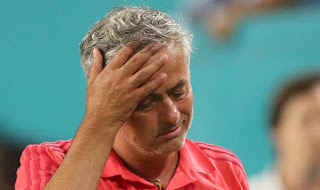 Much less seems to be expected, meanwhile, on the other side of Manchester, where United have been less-than-impressive in their transfer market activity, according to some observers. However, those that say there are no marquee signings clearly have never heard of Fred. The new arrival from Shakhtar may represent a risk, but don't be surprised if he adds a lot of extra flair to Jose Mourinho's team. Diogo Dalot arrives from Porto, while Lee Grant is a summer signing from Stoke. Love him or loathe him, Mourinho always sets up his teams so that they are hard to beat. Despite finishing last season trophy less, I expect a more successful United this season, as long as Mourinho gets the full support of the board. However, that is not a given, judging by an early season confrontation between him and Ed Woodward. Watch this space!